The next Club Acoustic Open Session will be on Wednesday 20th March at the Old Clubhouse in Buxton. It will start at 8:30 for music from around 9pm. Entry is free, and we welcome all, performers and audience alike! The next Club Acoustic Open Session will be on Wednesday 6th February, at the Old Clubhouse in Buxton. Doors open at 8:30 for music from around 9pm. We welcome all, and, as always, entry is free! Come along to play or to listen. 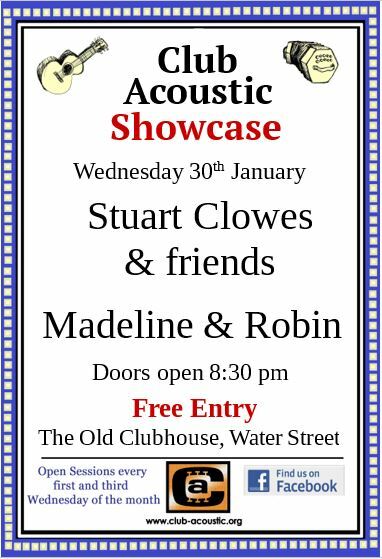 The next Club Acoustic Open Session will be on Wednesday 20th February, at the Old Clubhouse in Buxton. It will start at 8:30 for music from around 9pm. Entry is free, and we welcome all, performers and audience alike! The next Club Acoustic Open Session will be on Wednesday 6th February, at the Old Clubhouse in Buxton. Doors open at 8:30 for music from around 9pm. Entry is free, and everyone is welcome, whether you come to perform or to watch! The next Club Acoustic Open Session will be on Wednesday 21st November, at the Old Clubhouse in Buxton. Doors open at 8:30 for music from around 8:45. Entry is free, and everyone is welcome – to perform or to watch! Club Acoustic’s first open session of 2019 will be on Wednesday 2nd January at the Old Clubhouse from 8:30 pm (music from 9). As always, entry is free, and all are welcome!